As I mentioned earlier we spent Saturday at Hultberget outside of Eskilstuna. After lots of trips this spring to Fjärdhundra and Gåseborg we felt we needed to try something new. Camilla had been to Hultberget three years ago and liked it, even though the climbing then had been a bit too hard for her. It was with great expectations we set off early Saturday morning, however, it wasn’t long after our arrival the humiliation started. I had difficulties with the 6a+ route we chose to warm-up with. I had to hang serveral times and generally had huge problems finding holds and figuring out body movements. That’s quite unusual. I did make up for it a bit on the second climb for the day when I lead the same route again but doing the direct start that was graded 6b. It still felt quite hard though. 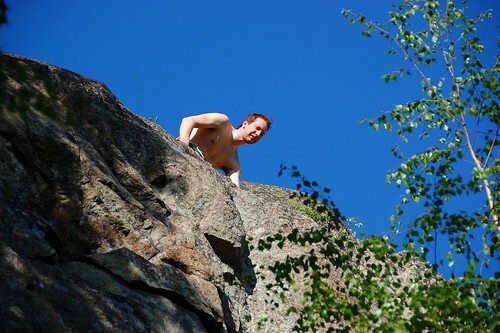 We continued with “En kvinnlig list”, a 6c route that we were recommended, where I got totally humiliated in the start. After pulling on some gear I did get past the first problem only to get stuck on the middle section where you are traversing to the right on quite poor holds for the hands, nothing for the feet and you have to stop and clip in the middle. I did manage that section in the end but it was after quite much hard work and cursing! After Camilla cruised the route on toprope! I had to try to lead it again. I figured out the beginning of the route after I got a hint to use a gaston for the left hand which helped a lot. So I rather easily got up to the middle section where the holds for the feet go away completely. I smear my right foot, manage to release my right hand and reach up and clip the rope, only to feel my energy drain by the second and a coward as I am I scream “Take!” to Camilla and I’m left hanging in the rope pondering another failure. The rest of the day continued in the same fashion. I read the guide book wrong and tried to onsight a 6c route instead of a 6b+ route. That didn’t go too well! When I finally found the 6b+ route it turned out to be hard as hell and I had to give up and go around the crag and set up a top-rope. Quite a failure! But it was a nice day with lovely Swedish spring weather, and I think our failures were mostly due to us not being that familiar with the crag and the type of climbing it requires. Hopefully we make up for it the next time we return.